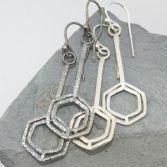 These elegant Double Honey Dangles with a textured finish have been designed, handcrafted and finished by me. They can have a bright silver or blue black oxidised silver finish, please select your preferred finish option using the drop down below. 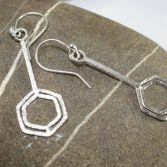 The ear wires and the earrings are handcrafted and each ear wire end is soldered together to prevent the earring being lost, each earring is 5cm long. 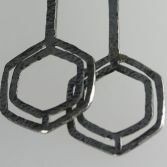 Your Double Honey Dangles have full UK hallmarks stamped at the Edinburgh Assay Office and all our bullion/silver is sourced from a reputable UK bullion dealer. 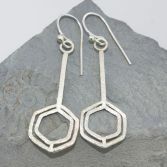 Whether buying for yourself or as a gift, the Double Honey Dangle earrings will be posted via Royal Mail 1st Class (signed for) to any UK address free of charge and will be presented in one of our signature gift boxes. UK Bees are in trouble and need our help! Please visit www.foe.co.uk the Friends of the Earth website where you will find information on how you can help save our UK Bees.